WOW - Congratulations! What a year for women in Houston, women in Texas, and their allies all over America. Celebrate progress and build towards the future with our 3rd Annual Houston MARCH FOR JUSTICE. RSVP today to receive updates including special announcements and day-of event guidance. Volunteer: Click here to volunteer at the March. T-shirts, caps and other official gear are here at the online store. Donate to help us afford sound systems, port-o-potties, peace officers, clean-up, ADA and permitting. We're 100% volunteer-led, and all the money goes directly to the March. 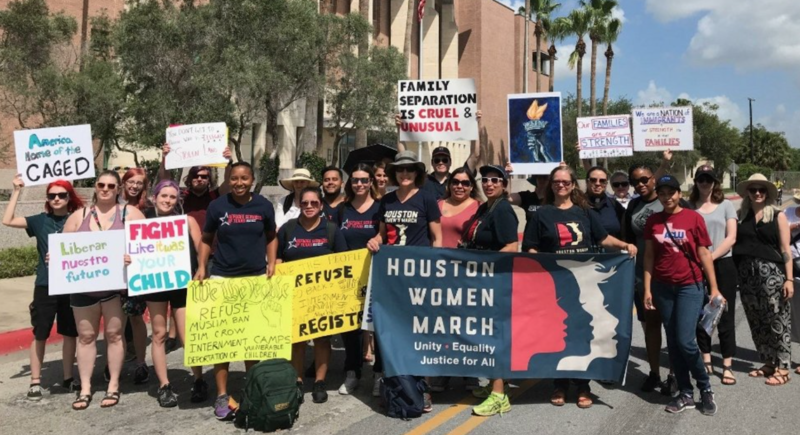 Your Houston Women MARCH ON is allied with the progressive "March On" coalition of grassroots organizations across the country. You can learn more about March On here, and see photos from our GOTV collaboration called "March on the Polls." The Houston Women's March is a 501c3 independent Texas nonprofit. We are not affiliated with the national "Women's March Inc." We stand AND MARCH against anti-Semitism, racism, and agendas of hatred, and you can read more in this op-ed in the Houston Chronicle.